She was on the cover of Sports Illustrated as a girl and carried the Olympic torch as a young woman. Three-sport athlete at Deering High School (Portland, Maine) and star infielder at the University of New England. Ranked second in her high school class and in college, graduated with honors with a degree in business administration. Played 14 seasons and hundreds of games with Coastal Athletics softball team that represented Maine in five national tournaments. Yet somehow Kimberly Ann Tudor flew under our radar for her 32 years among us. A quick search of this newspaper's electronic archives yielded snippets of information. Tudor's grand slam won the game. Tudor's two-run single was the difference in another game. References to other games. Listings on Deering's honor roll. A mention that she was Deering's female nominee for the Maine Sports Hall of Fame student-athlete Award. Second-team Telegram League All-Star. "She didn't want the attention," said Art Piteau, who, with Greg Jordan, coached the Coastal Athletics women's softball team. "She wanted the team to get the attention and she'd share." 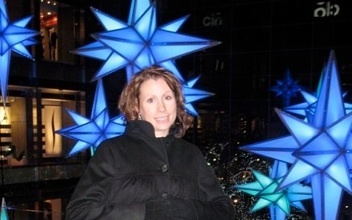 Kim, or Kimmee, as she was known to friends, died of a ruptured brain aneurysm three days after the Christmas of 2008. A new homeowner, she was found in her house. Friends and family organized a memorial walk last year but not before a lot of tears and much debate. "Clearly, Kim would not have wanted it about her," said Dave McCausland, her uncle. "Then we made the connection with the Brain Aneurysm Foundation and felt better." Brain aneurysms are the lightning bolts that seemingly come from out of the blue. There are warning signs if you know how to look. "A sudden, severe headache," said McCausland. "The worst headache of your life, worse than a migraine, dizziness, numbness. It's similar to a stroke." Forty percent of those who suffer a brain aneurysm die in a few minutes, said McCausland, who researched the data. Half of those who survive have long-term disabilities. Peter Gammons, New England's favorite baseball journalist, suffered a rupture of a brain aneurysm in 2006 and has returned. That same year, Heidi Sipe, then McCausland's girlfriend and now his wife, woke him in the middle of the night at their home in Mount Vernon. She had a terrible headache. Her arms were numb. Kim met them at the emergency room at the hospital in Portland where Heidi's condition was quickly recognized. While Dave held Heidi's hand, Kim found a computer and researched brain aneurysms. She returned to her uncle and drew him a diagram and described the seriousness. That was Kim Tudor. To Piteau, she was the ballplayer who played for the moments, big and small, that won games. "She had a great arm. You could hear the ball hiss when it left her hand. She was very competitive but she knew how to enjoy the game. She knew the game. She was the one player I could coach by eye contact." To her teammates and friends it was the constant kindnesses. Val Andrews, a graduate of Old Orchard Beach High and the University of Connecticut, recalls how easily and quickly she was made to feel part of a new team, thanks to Kim. Angel Wiggin, a single mom, wept remembering how Kim found time to attend her son's ballgames. They remember Kim's infectious giggle. Her love of the Red Sox and how often she'd accompany her mother, Nancy, to Fenway Park. On a long-ago visit to Fenway, Kim was caught by a photographer in a group of fans looking for autographs. The photo landed on a Sports Illustrated cover in August 1990, hyping the featured story inside on Autograph Madness. "It was a fluke," said McCausland. "She was flabbergasted when she saw it. Strictly serendipity. "For Christmas of 2007, McCausland found the magazine cover, had it framed and gave it to his niece as a gift. "It was important to her to see other people balanced and happy," said McCausland. "Time management was her problem. Many times there wasn't 30 minutes left over for her. She was the friend you'd want. She was the wife you'd want." She dated, say her friends, but never found the man who could give her what she gave them. At her high school graduation, Kim closed her salutatorian's speech by urging her Deering classmates to "choose for each moment in time to either live it or leave it, either march or watch the parade from the sidewalk. To either join winners who dared or those who never tried to compete." She added a familiar quote from legendary basketball coach John Wooden: You should learn as if you were to live forever; live as if you were to die tomorrow."